His father, William George, had been a teacher in both London and Liverpool. He also taught in the Hope Street Sunday Schools, which were administered by the Unitarians, where he met Unitarian minister Dr James Martineau. In March of the same year, on account of his failing health, William George returned with his family to his native Pembrokeshire. He took up farming but died in June 1864 of pneumonia, aged 44. His widow, Elizabeth George (1828–96), sold the farm and moved with her children to her native Llanystumdwy in Caernarfonshire, where she lived in a cottage known as Highgate with her brother Richard Lloyd (1834–1917), who was a shoemaker, a minister (in the Scottish Baptists and then the Church of Christ), and a strong Liberal. Lloyd George was educated at the local Anglican school Llanystumdwy National School and later under tutors. Lloyd George's uncle was a towering influence on him, encouraging him to take up a career in law and enter politics; his uncle remained influential up until his death at age 83 in February 1917, by which time his nephew had become Prime Minister. He added his uncle's surname to become "Lloyd George". His surname is usually given as "Lloyd George" and sometimes as "George". The influence of his childhood showed through in his entire career, as he attempted to aid the common man at the expense of what he liked to call "the Dukes" (that is, the aristocracy). However, biographer John Grigg argued that Lloyd George's childhood was nowhere near as poverty-stricken as he liked to suggest. ^ "Criccieth church of Christ, Wales and David Lloyd George". churches of christ. Retrieved 9 February 2016. ^ Grigg, John (1997). "Preface to New Paperback Edition". The Young Lloyd George. London: HarperCollinsPublishers. p. 12. ISBN 000686306X. ^ Simkin, John (2015). "David Lloyd George". spartacus-educational.com. Retrieved 10 February 2016. ^ Rowland, Peter (1975). "M.P. for Caernarvon Boroughs, 1896-1900". Lloyd George. London: Barrie & Jenkins Ltd. pp. 125–126. ISBN 0214200493. ^ Bogdanor, Vernon (20 January 2011). "The coalition is held together by fear". New Statesman. Retrieved 29 August 2014. ^ "Coal still uniting the community". bbc.co.uk. 11 December 2008. Retrieved 10 February 2016. ^ "Our Former Presidents: London Welsh Centre". London Welsh Centre website. London Welsh Centre. Archived from the original on 20 July 2011. Retrieved 4 February 2011. ^ "David Lloyd George remembered". Wales. 17 January 2013. Retrieved 11 February 2018. ^ Longford, Jennifer (10 July 2007). "Memories of David Lloyd George". lloydgeorgesociety.org.uk. Retrieved 5 October 2010. ^ "Dan Snow: History boy – Profiles – People – The Independent". The Independent. 26 July 2008. Retrieved 2 September 2014. ^ "Next generation takes charge". Financial Times. London. 25 April 2007. Admiral of the Fleet John Rushworth Jellicoe, 1st Earl Jellicoe, was a Royal Navy officer. He fought in the Anglo-Egyptian War and the Boxer Rebellion and commanded the Grand Fleet at the Battle of Jutland in May 1916 during the First World War. His handling of the fleet at that battle was controversial. Jellicoe made no serious mistakes and the German High Seas Fleet retreated to port, at a time when defeat would have been catastrophic for Britain, but the public was disappointed that the Royal Navy had not won a more dramatic victory. 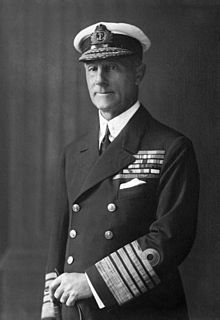 Jellicoe later served as First Sea Lord, overseeing the expansion of the Naval Staff at the Admiralty and the introduction of convoys, but was relieved at the end of 1917. He also served as the Governor-General of New Zealand in the early 1920s. Herbert Henry Asquith, 1st Earl of Oxford and Asquith,, generally known as H. H. Asquith, was a British statesman and Liberal Party politician who served as Prime Minister of the United Kingdom from 1908 to 1916. He was the last prime minister to lead a majority Liberal government, and he played a central role in the design and passage of major liberal legislation and a reduction of the power of the House of Lords. In August 1914, Asquith took Great Britain and the British Empire into the First World War. In 1915, his government was vigorously attacked for a shortage of munitions and the failure of the Gallipoli Campaign. He formed a coalition government with other parties, but failed to satisfy critics. As a result, he was forced to resign in December 1916, and he never regained power. Edward Grey, 1st Viscount Grey of Fallodon,, better known as Sir Edward Grey, was a British Liberal statesman and the main force behind British foreign policy in the era of the First World War. An adherent of the "New Liberalism", he served as foreign secretary from 1905 to 1916, the longest continuous tenure of any person in that office. He is probably best remembered for his "the lamps are going out" remark on 3 August 1914 on the outbreak of the First World War. 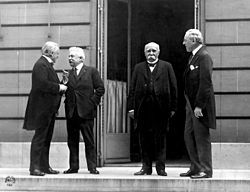 He signed the Sykes-Picot Agreement on 16 May 1916. Ennobled in 1916, he was Ambassador to the United States between 1919 and 1920 and Leader of the Liberal Party in the House of Lords between 1923 and 1924. The 1918 United Kingdom general election was called immediately after the Armistice with Germany which ended the First World War, and was held on Saturday, 14 December 1918. The governing coalition, under Prime Minister David Lloyd George, sent letters of endorsement to candidates who supported the coalition government. These were nicknamed "Coalition Coupons", and led to the election being known as the "coupon election". The result was a massive landslide in favour of the coalition, comprising primarily the Conservatives and Coalition Liberals, with massive losses for Liberals who were not endorsed. Nearly all the Liberal M.P.s without coupons were defeated, although party leader H.H. Asquith managed to return to Parliament in a by-election. Reginald McKenna was a British banker and Liberal politician. His first Cabinet post under Henry Campbell-Bannerman was as President of the Board of Education, after which he served as First Lord of the Admiralty. His most important roles were as Home Secretary and Chancellor of the Exchequer during the premiership of H. H. Asquith. He was studious and meticulous, noted for his attention to detail, but also for being bureaucratic and partisan. Edwin Samuel Montagu PC was a British Liberal politician who served as Secretary of State for India between 1917 and 1922. Montagu was a "radical" Liberal and the third practising Jew to serve in the British cabinet. Walter Runciman, 1st Viscount Runciman of Doxford, was a prominent Liberal and later National Liberal politician in the United Kingdom between the 1900s and 1930s. Field Marshal Sir William Robert Robertson, 1st Baronet, was a British Army officer who served as Chief of the Imperial General Staff (CIGS) – the professional head of the British Army – from 1916 to 1918 during the First World War. As CIGS he was committed to a Western Front strategy focusing on Germany and was against what he saw as peripheral operations on other fronts. While CIGS, Robertson had increasingly poor relations with David Lloyd George, Secretary of State for War and then Prime Minister, and threatened resignation at Lloyd George's attempt to subordinate the British forces to the French Commander-in-Chief, Robert Nivelle. 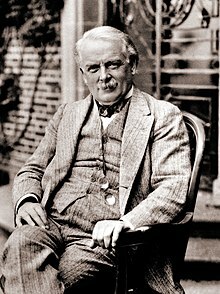 In 1917 Robertson supported the continuation of the Third Ypres Offensive, at odds with Lloyd George's view that Britain's war effort ought to be focused on the other theatres until the arrival of sufficient US troops on the Western Front. The Shell Crisis of 1915 was a shortage of artillery shells on the front lines of World War I that led to a political crisis in Britain. Military historian Hew Strachan argues that strategic plans caused an over-reliance on shrapnel to attack infantry in the open, which caused a shortage of high-explosive shells in most major armies. At the start of the war there was a revolution in doctrine: instead of the idea that artillery was a useful support for infantry attacks, the new doctrine held that heavy guns alone would control the battlefield. Because of the stable lines on the Western Front, it was easy to build rail lines that delivered all the shells the factories could produce. The "shell scandal" emerged in 1915 because the high rate of fire over a long period was not anticipated and the stock of shells became depleted. Prime Minister H. H. Asquith formed a wartime coalition government in May 1915. The change of ministry resulted from intense attacks on the Liberal government claiming it had badly mishandled the war effort, especially regarding the Gallipoli Campaign against Constantinople and the Shell Crisis regarding shortage of ammunition on the Western Front. 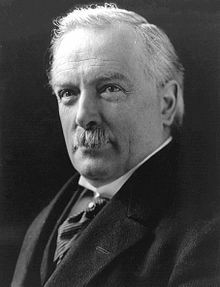 Liberal David Lloyd George formed a coalition government in the United Kingdom in December 1916, and was appointed Prime Minister of the United Kingdom by King George V. It replaced the earlier wartime coalition under H. H. Asquith, which had been held responsible for losses during the Great War. Those Liberals who continued to support Asquith served as the Official Opposition. 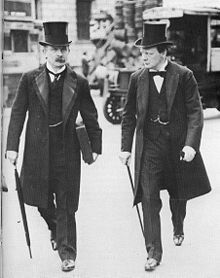 The government continued in power after the end of the war in 1918, though Lloyd George was increasingly reliant on the Conservatives for support. After several scandals including allegations of the sale of honours, the Conservatives withdrew their support after a meeting at the Carlton Club in 1922, and Bonar Law formed a government. George Allardice Riddell, 1st Baron Riddell, known as Sir George Riddell, Bt, between 1918 and 1920, was a British solicitor, newspaper proprietor and public servant. Sir Joseph Davies was a Welsh businessman, commercial statistician and Liberal Party politician. He was one of a talented group of men and women who worked closely with David Lloyd George during his premiership as a key member of Lloyd George's wartime secretariat, known as the Garden Suburb.